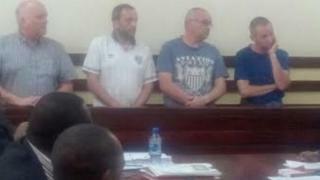 Four British plane spotters in Kenya have been ordered to pay £1,400 ($2,000) or face a year in jail for trespassing at an airport in Nairobi. The four men from Greater Manchester were caught taking pictures at Wilson Airport in the capital and have been in custody for more than a week. They remain in detention at the police cells at the main international airport until the fine is paid. The men said officials at the airport had given them permission to film. But they sparked a security alert after they were spotted from the airport bar. The BBC'S Alastair Leithead in Nairobi says in the end they admitted to two charges in court - of trespassing, and taking pictures of aircraft - which each carried a fine of £700. Peter Swift, whose brother Eddie is one of the arrested men, told the BBC all families were particularly concerned about the four being transferred from police custody to jail. He had spoken to his brother on the phone who is "very, very scared", he said. A leaked memo from the Kenya Airports Authority last month warned of possible attacks by al-Shabab militants. The Somalia-based group has been behind several deadly attacks in Kenya in recent years.